Having a smart estate plan is essential for everyone—regardless of assets, age, or income. You might think estate planning is something you can put off until your later years, or that it’s just for the super wealthy, or both. But setting up a clear path for what happens to your property and your family after your passing can make life for your heirs much easier in a time of stress and grief. That’s where an estate plan comes in. Here’s what you need as part of a solid estate plan, no matter your assets, age, or income. This basic legal document will set up who will get what—without having the state step in and make those decisions, which is often a headache for your heirs and can cost them more money in the long run. A will is especially important if you have minor children and are a single parent. If you don’t do any planning for your children, they have to go into a guardianship, which can be traumatic, while the legal system sorts out who your children will be living with in the future. Plus, a judge may decide on a guardian you would have never have chosen yourself. By having a will that states who your children’s guardians will be in case something happens to you, you can ensure that they will be raised by the people you choose, not by those appointed by a judge. If something happens to you and you can’t make decisions for yourself, who will be in charge? Who will make sure that your bills are paid and that medical decisions are made with your best interests and wishes in mind? Your estate should determine who holds your power of attorney. An advance healthcare directive (also known as living will, personal directive, advance directive, medical directive or advance decision) is a legal document in which a person specifies what actions should be taken for their health if they are no longer able to make decisions for themselves because of illness or incapacity. In the U.S. it has a legal status in itself.This document helps both you and those who will care for you by specifying your wishes ahead of time. A trust can do a couple of important things. 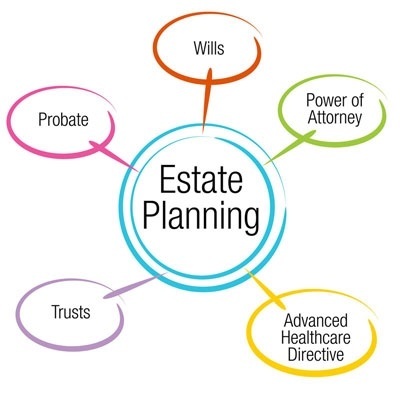 First, it means your estate will not go through probate, a process that can delay assets being passed on to your heirs. A trust can also be set up for special needs or minor children. It will determine how the assets they inherit will be used to support them, who will make those decisions, and when the children can take over the money themselves, if ever. If you need to prioritize your efforts, focus on getting a will, power of attorney and health care directive in place. If you don’t know an attorney, I can refer you to one. Getting these documents in place is not as expensive as you might think, but the peace of mind is priceless.